Hammock Pointe is located in the Georgetown County area of Murrells Inlet. If by some chance you’ve never heard of Murrells Inlet, it’s the Seafood Capital of South Carolina and birthplace of those delicious hushpuppies. This small community, situated just off of Pinnacle Drive, is a few minutes from the Marshwalk and a true coastal paradise. At Hammock Pointe, you can relax, live out your dream retirement, or raise a family here. This new community of thirty-one home sites offers amazing panoramic views and has 4 models to choose from. These floor plans include The Avenel at 1995 sq ft, Sawgrass at 2051 sq ft, Southwind at 2246 sq ft, and Summerlin at 2577 sq ft. 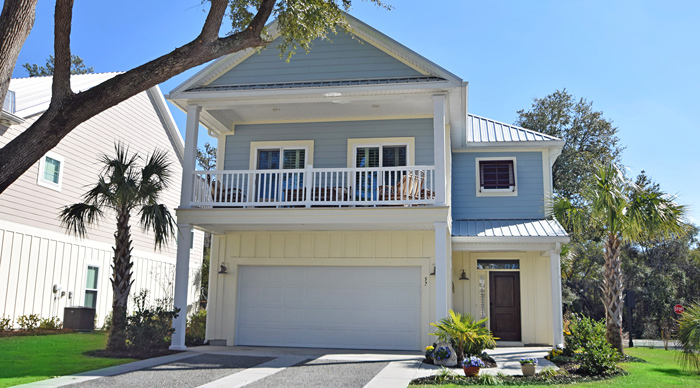 These raised beach style homes have galvanized metal roofs and a pastel exterior that adds to the tropical feel. The community is being developed by CalAtlantic, formerly Ryland Homes. there are still lots available as well as finished homes. Prices start at about $315,000 and average around $350,000. All homes come with a three bedrooms and 2.5 baths, nine-foot ceilings, trim upgrades, and energy efficient appliances. Your flooring choices are carpet, tile, and hardwood. Utilities run underground. Located east of Ocean Highway where Hwy 17 Business and Bypass meet, Hammock Pointe's location is its greatest benefit. Best yet, this beachy neighborhood is waiting for you. Murrells Inlet is home to tall, Spanish Moss-draped cypress and oak trees, hiking trails, swaying palms, undeveloped beaches, and the popular Marshwalk. In addition to being a fisherman’s oasis, Murrells Inlet is an antique collector’s destination as well as home to the best seafood in the Grand Strand. You are also a short drive from the attractions of Myrtle Beach, where you'll find more fine dining and entertainment. Hammock Pointe the best that Low Country living has to offer. Call us for a tour or more information about the homes at Hammock Pointe in Murrells Inlet.